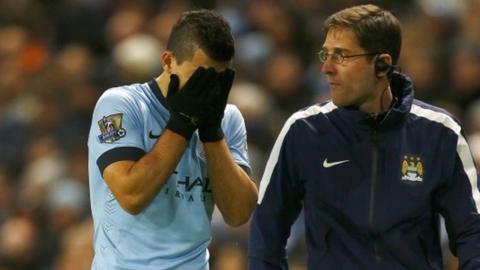 Manchester City striker Sergio Aguero is set to miss between four and six weeks with a knee ligament injury, manager Manuel Pellegrini says. The Argentine, 26, was injured in the third minute of Saturday's 1-0 win over Everton after a challenge with Muhamed Besic, and left the pitch in tears. "He will be out for four to six weeks," said Pellegrini, whose side face Roma in the Champions League on Wednesday. "It will depend on his recovery. But our team doesn't depend on one player." City are trying to avoid Champions League elimination in Rome, and the absence of Aguero - the Premier League's top scorer with 14 goals - is a big blow. Pellegrini's side will be knocked out if Group E rivals CSKA Moscow win away to Bayern Munich. A draw for Leonid Slutsky's side in Munich would mean City need to win in Rome to go through. But a score draw would be enough for Pellegrini's team if CSKA lost. Aguero has earned widespread acclaim for his performances this season, with Pellegrini hailing the striker as "one of the best players in the world". His highlights include scoring all four in a 4-1 rout of Tottenham on 18 October and a hat-trick in the 3-2 Champions League win over Bayern Munich on 25 November.